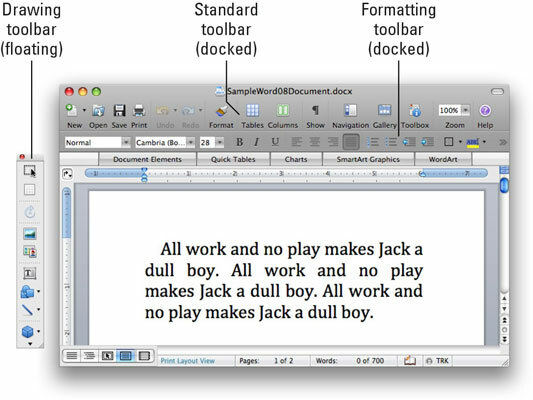 All the Office 2008 for Mac applications offer at least one toolbar, which you can think of as a visual menu. You click a button on the toolbar to execute the command. To find out what a button on a toolbar does, move your mouse cursor directly over it and don’t move it for a few seconds. The button’s name then appears in a little yellow box called a tool tip. You can show or hide the Word, Excel, and PowerPoint preconfigured toolbars by choosing View→Toolbars. Toolbars with a check mark before their name are visible; toolbars without a check mark are hidden. 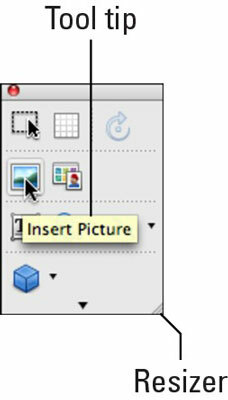 To change the size or shape of a toolbar, drag the diagonally striped resizer in its lower-right corner. You can hide a floating toolbar by clicking the red dot in its upper-left corner. To make it reappear, choose it from View→Toolbars. To hide both docked and floating toolbars, choose their names from View→Toolbars to remove the check mark. You can add or delete commands from the preconfigured toolbars or create your own custom toolbars from scratch by choosing View→Customize Toolbars and Menus.